Our power came on around 4:30 yesterday afternoon, so we finished packing for our trip, and loaded up the car. We checked out the freezer to see how our frozen foods had done during the outage. Everything that was in the basement freezer was solid, but the items we moved down from upstairs had started to thaw, so we moved it to the fridge and told my parents to eat bacon and hot dogs since we didn’t want it to go to waste. Then we hit the road for Nashville. It started to get dark around Paducah, so we stopped for dinner at Fazoli’s, and then pushed on to Nashville. We arrived at 11:30 and made it to the room by 11:50. At least we managed to get there before the day ended. The Loews Vanderbilt hotel in Nashville is a great hotel, especially when coupled with a great rate from Hotwire.com. The room was huge, and looking at the floor plan on the room door, it was obvious it was the biggest room on the floor. I think the front desk person bumped us up since we looked pretty wore out and had our sob story about the power situation in St. Louis. We checked out this morning and headed for Bread & Company, our new favorite breakfast place in Nashville. We discovered this place. I really wish we had these in St. Louis; they’d give St. Louis Bread Company a run for the money (I think). After a tasty egg sandwich for me (and a chocolate chip waffle for Kristin), it was off to Lynchburg and the Jack Daniels Distillery. Lynchburg is a tiny town (population 361), but if you ever have the chance, stop by and visit the distillery for a tour. I’m not a whiskey drinker (or a drinker at all save a glass of wine now and then), but it was a great tour with a lot of history. 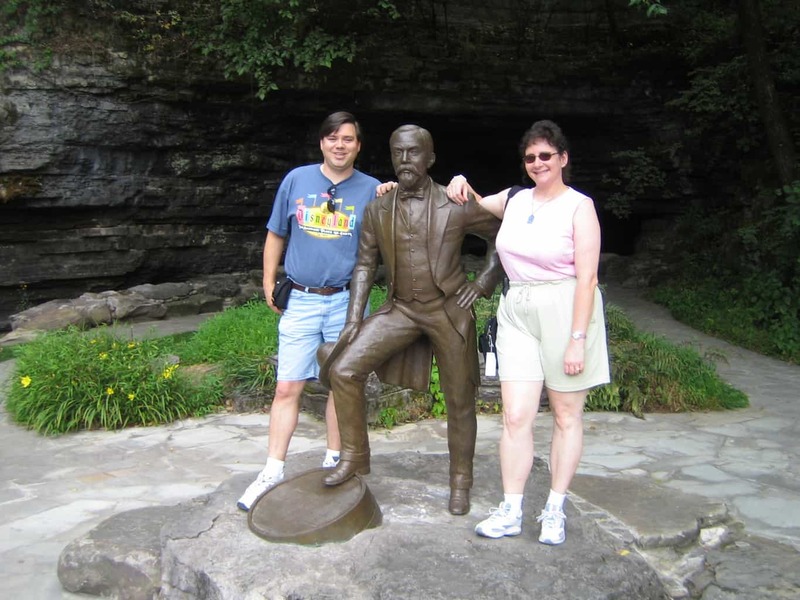 Here’s a photo of us with a statue of Jack Daniels in front of the Cave Spring where they get all the water used to make their products. After the tour, we did some shopping at the gift shop in Lynchburg, then made our way to Huntsville where the Dingler Family Reunion is being held this weekend.